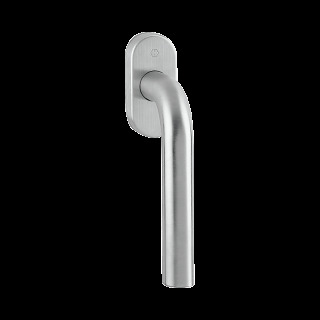 Steel tilt and turn window handle Hoppe Bonn series on oval rose. Light door handle, compact and durable. The components used in the assembly are designed and patented to fulfill functions up to 10 years. With Secustik technology this window handle protects your windows from external break-ins. Item shipped in the original box Hoppe. Find out more of Hoppe Secustik protection!